The Information Technology Program at UMass Amherst seeks to educate a broad spectrum of students to be the leading IT practitioners and thinkers. 108 courses, offered by ten schools and colleges, contribute to our curriculum. The IT Program also coordinates the annual Information & Communication Technology Summit and collaborates to facilitate the Open Education Initiative, as well as, outreach through Five College, Inc. & local colleges. The undergraduate Minor in Information Technology is a interdisciplinary program in which students study information and communication technology, its applications in many areas of scholarship, and its social and other effects. The overall goal of the minor is to enable any student to confidently employ technology, and to secure an intellectual platform from which to develop the capacity to innovate, using information and communication technology within their field. 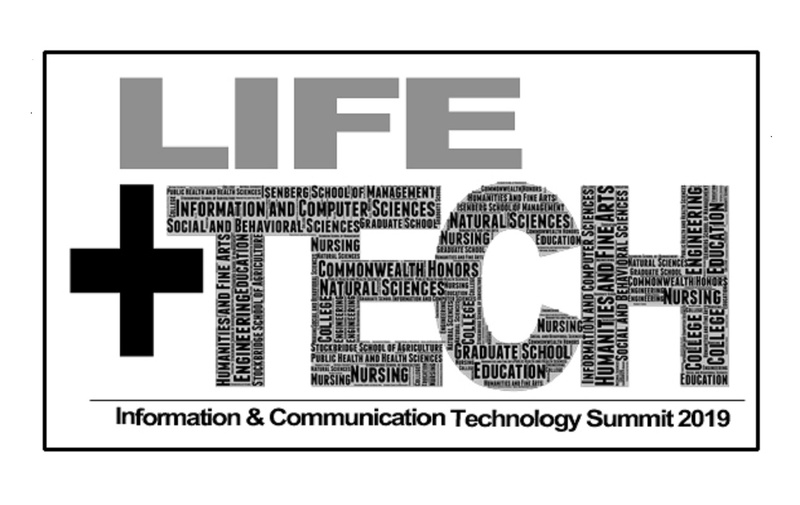 A day-long conference focusing on the symbiotic relationship between life and technology. We encourage presentations on both the benefits and challenges of technology across all disciplines and aspects of society. The annual Information & Communication Technology Summit is a one-day regional conference that brings together UMass and Five College students with faculty -- and the public -- to explore how Information and Communication Technologies are transforming education, academic disciplines, business, and our everyday lives. The Computer Competency Certification educates and tests students about the fundamentals of the use of computers. It consists of 12 modules with topics ranging from computer hardware to production software to digital citizenry. Partners include the UMass Amherst Commonwealth Honors College and the School of Humanities and Fine Arts. IT Minors have seats for enrollment in some very sought after courses! Minors are not indicated in SPIRE, so some courses require department overrides to register. View IT Minor courses for the Winter 2019 and Spring 2019 semesters. Check out our Courses page for listings. Course availability subject to change. Please report any discrepancies to itadvisor@provost.umass.edu. The IT Program Office has moved to The LGRC lowrise A243! The IT Program Office is in the process of moving to The LGRC lowrise A243! Please, feel free to contact us at: itprogram@provost.umass.edu We look forward to seeing you! Read more about The IT Program Office has moved to The LGRC lowrise A243!